Why consider a coconut milk smoothie? Coconut milk is yet another option for making delicious non dairy smoothies. You’ve already learned about the benefits of making smoothies with almond milk, as well as the benefits of soy milk. (If you haven’t, I recommend you read those pages, before or after reading this one). We've covered how both almond milk and soy milk make a great non dairy milk substitute. You can use the plain or vanilla variety as a milk substitute, or use the chocolate varieties instead of chocolate milk for making yummy healthy milkshakes. But what if you’re craving a tropical twist? Or you’re looking to reap some of the incredible nutritional benefits of coconut? Coconut milk may just be your new best friend for making smoothies! I was living in Spain for one year, happily accustomed to shopping in regular Spanish grocery stores and making pretty basic meals with the ingredients I found there. Then my friend (creator of these amazing superfood smoothies) came to visit for awhile, and he introduced me to the wonders of coconut milk for cooking. Yeah, we had to drive to the outskirts of town to shop in the giant megastore Eroski, and only then did we find a few cans of coconut milk on the bottom shelf of the limited “international foods” section. And at 2 euros per can, it was definitely pricier than it should have been…but it makes sense, as Spain is nowhere near tropical. But it was sooo worth it as I learned to concoct some easy yet incredibly flavorful exotic vegetarian meals with it, such as my new favorite, coconut carrot curry soup. From then on I was addicted to using coconut milk for cooking, something that my Spanish roommates thought was a bit strange, but made my diet so much more interesting. Then I returned to California, to the paradise also known as Trader Joe’s, and found they also sell coconut milk beverage in boxes, right next to the soy milk and almond milk (also a new discovery for me at that time). They also sell light coconut milk in cans ($1 per can), which is great for cooking. But I quickly discovered that the coconut milk beverage makes an incredible liquid smoothie ingredient. It’s lighter and more liquidy than the canned coconut milk, which makes it better for drinking. You can use either option for making coconut smoothies, depending on what you have on hand and what you prefer. 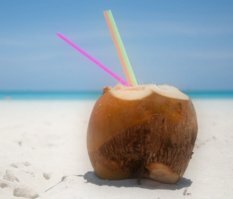 So What Is Coconut Milk? If you have never discovered coconut milk, you’re in for a treat! It’s technically considered a nut milk (coco-nut…get it? ), so it’s in the same category as almond milk. Along with soy milk, almond milk and various others, it’s a type of plant milk…and yes, plant milk is a type of milk! (Contrary to what my dad believes… the dictionary proves him wrong!). Coconut milk is a staple food in tropical diets. It has a history of being used for its homeopathic health benefits in India and several Pacific Islands, but these benefits are not 100% scientifically confirmed. It has a slightly sweet taste, and a very creamy texture. I recommend you find a thin or light variety for smoothies as well as cooking, because otherwise it could be way too thick and creamy (especially for smoothies). It’s an excellent dairy free beverage option for vegan smoothies, since it contains no animal products. The only problem with coconut milk, unlike almond milk, is it has rather high levels of saturated fat. So use coconut milk sparingly…as an occasional treat for a special recipe, but not as an everyday staple. For example, I noticed that after I would finish a meal I made with coconut milk, such as coconut curry soup, I would end up with a heavy feeling in my stomach because it has so much fat. It was still nothing compared to the heavy feeling I used to get from eating meat, but it definitely is a heavier feeling than other plant foods, and not something I would eat everyday. One good thing is that this is a nut fat, and healthy nut fats do have a place in your healthy diet. That's because they are an excellent source of monounsaturated fat. Just don’t go overboard. Everything in moderation, right? You can use coconut milk to make some awesome coconut milk smoothie recipes! Use coconut milk on its own, or in addition to fresh coconut to enhance that coconut flavor even more. 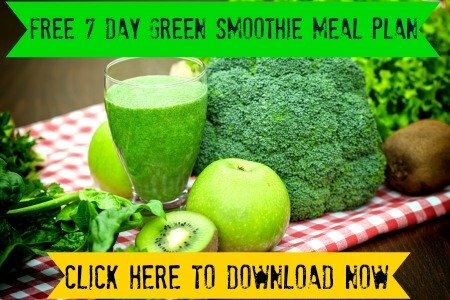 I can't get enough of this high protein superfood smoothie recipe, which features coconut milk. You can also use coconut milk to make tons of other tropical smoothies. Coconut milk doesn’t even have to be the main focus of the coconut milk smoothie recipe, but it can help give a tropical smoothie an even more “tropical” twist! *Add some coconut milk into any of these tropical smoothie recipes for an even more exotic, tropical taste! This is part 4 of the Liquid Smoothie Ingredients Series. Remember, a liquid base is the foundation of any good smoothie recipe. Click any of the links above to learn about your other smoothie ingredient options!